Big Tex, raised into position Sept. 26, 2011. Organizers with the State Fair of Texas are now taking donations to help fund the rebuilding of Big Tex. Big Tex was destroyed by a fire in October in the last days of the fair. Sue Gooding, with the State Fair, said Big Tex was insured for between $180,000 and $200,000, but that the costs to rebuild him, and to prepare the area in which he stands, will come close to $600,000. While sponsors have come forward to make donations toward his rehabilitation, the State Fair is accepting donations from private individuals as well after many people asked how they could help. Gooding said the State Fair is committed to bringing Big Tex back to life in time for the 2013 State Fair and that he'll now have engineering upgrades that will include a fire suppression system. He'll be a lot heavier, Gooding said, and maybe even a few feet taller. 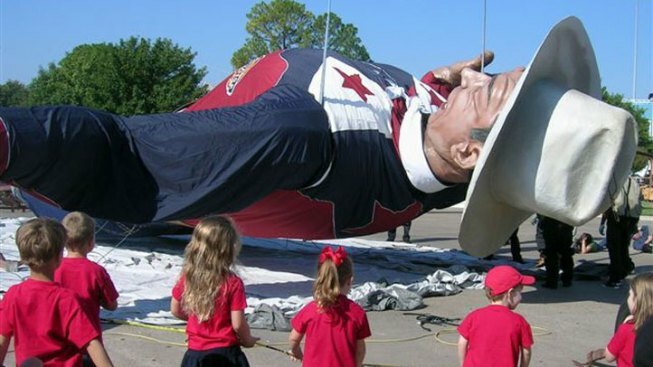 Officials with the State Fair of Texas said they hope to have small-scale mockups of the new Big Tex in the next few weeks -- but that they plan to keep him under wraps ahead of his big debut in September. Those wishing to make donations to the construction effort can do so at BigTex.com. Donations will be used to rebuild, maintain and preserve Big Tex, Gooding said.